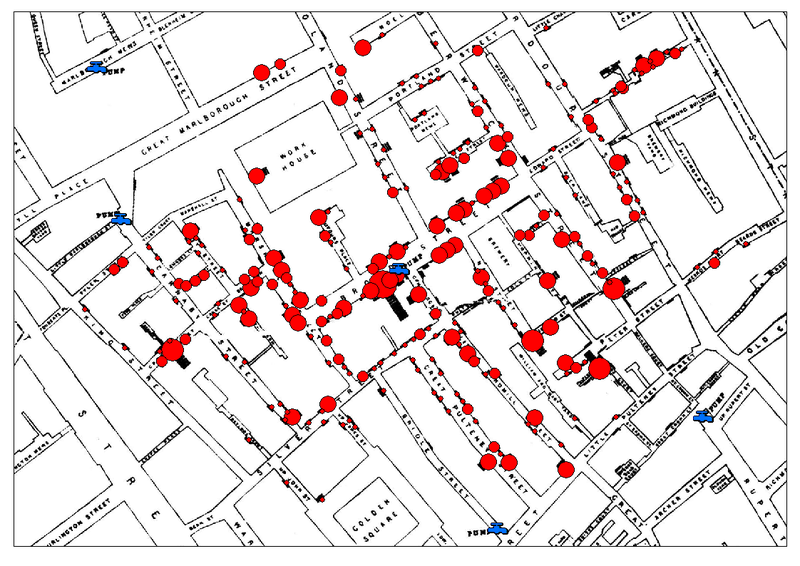 In honour of the bicentenary of John Snow’s birth – and because I was asked to by someone via email – I have now released my digitisation of John Snow’s Cholera data in a few other formats: KML and as Google Fusion Tables. To save you reading my previous blog posts on the subject, I’ll give a brief overview of my data. 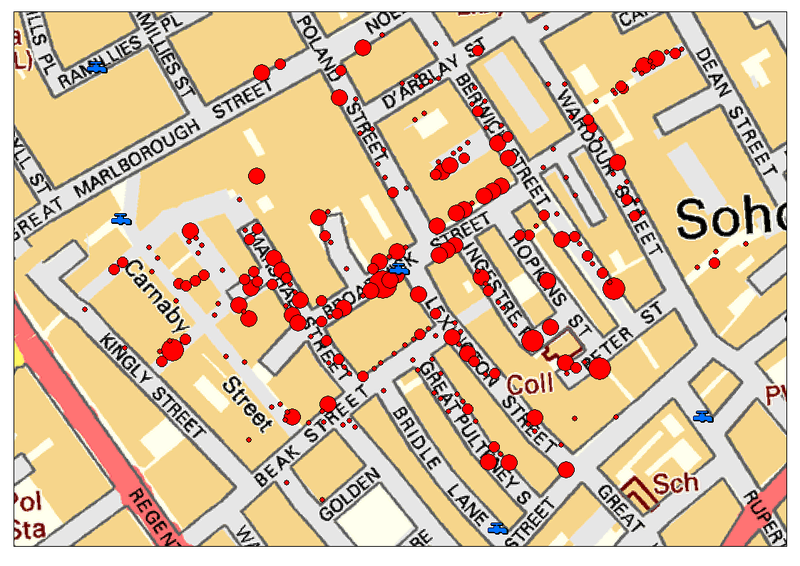 John Snow produced a famous map in 1854 showing the deaths caused by a cholera outbreak in Soho, London, and the locations of water pumps in the area. By doing this he found there was a significant clustering of the deaths around a certain pump – and removing the handle of the pump stopped the outbreak. This is a bit of a simplification (see Wikipedia or the John Snow Society for more details), but generally covers what happened. The latter is particularly cool, I think as it allows you to very easily overlay the data on modern Google Maps data, and should allow some interesting ‘mashups’ to be created. All of the tables are set to be shared publically, so you could be able to copy them (using the Copy Table command in the File menu) and play around with them as much as you want! If you click the Example Map tab then you’ll see a very rudimentary map I’ve created using the data on top of Google Maps (see below) – I’m sure you’ll be able to do far better visualisations than that. The folks at CartoDB have also used this data in one of their tutorials which shows you how to import the data to CartoDB and create a styled map to show the deaths with different sized markers – yet another way you can use the ‘first real GIS data’ in today’s modern web-based GIS tools. So, enjoy – and please let me know (via the comments below) what you create! Update: There was a problem with the KML files and Google Fusion Tables that I uploaded yesterday, caused by an incorrect co-ordinate transformation between the Ordnance Survey grid references and latitude/longitude. This has now been fixed and the downloads and tables have been updated. Sorry about this. I am intending to use this in a visualisation course next semester. Thanks for providing the data. Will use this for politics of environmental issues course on origins of public health policies. Thanks! This is great, really helpful, thank you! I’ve just created my John Snow’s Map using Google Maps Engine! Thanks!!!! It was great to find the data. I am making a map for Intro to Cart, thanks. This is a great post!!! Will use this visualization for presenting John Snow data in Spatial Class! Curious if anyone is working with Snows original data, and if he tracked not just deaths by location, but date as well? Looking to insert a time element to the cholera map. Could you please tell me what projection was used for the vector data? I have downloaded the death data and I am trying to run some analyses using ArcGIS software. It’s the Ordnance Survey British National Grid projection (see http://spatialreference.org/ref/epsg/osgb-1936-british-national-grid/). Projection files are included with the shapefiles in the download, so it should automatically be projected properly in ArcGIS. Thanks a lot for the explanation. The points somehow were not automatically projected first time that I had tried, but let me try it again. Thanks for the data table Robin. We have been studying diseases with our Year 9 students and I have made a GoogleEarth kml file displaying the data as 3D polygons and adding links, photos etc.. Only shame is that on Streetview at the moment, you can’t see ‘the’ pump as there is a building site around it! The kml is on the KS3 page of our department website (http://www.brygeog.net/ks3.html) under the Tropical Diseases section. DId it happen and any of you guys has a shape file for population density during that time? Sorry, no, I don’t know of any information on population density at the time. I will use these graphs as a good example in a course of data visualization. Thanks for your great job! Hello Robbin I just located you site and did not know you existed. Do you have any access to Snow’s data from the two water companies. I wanted the statistics from the first and 2nd experiment to see how significant it might be. Unfortunately I am giving a talk on Wed of this wee (10/3/18) so there is little time but in the event that you happen to have access I can use it later. Sorry for the short notice. Unfortunately I don’t have any more information than the stuff that’s already on my website. Sorry!